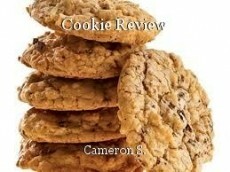 Cookie Review, miscellaneous by Cameron S.
Cookies are made from hand. You don't realize how much work is put into a cookie. Sometimes you just have to grab a box of chips ahoy. Then some grandma's just do it from hand. People just become more used to being lazy by going to their local grocery store. That's just wrong folks. People get paid only $7 an hour just to make one cookie look so satisfing. So the lesson is that the next time you bite into an oreo, think about the person who made it. Or you could just give me all your cookies in the pantry a'right? Let me know if you want me to do a ridiculous reviews!!! A CASE OF THE MONDAYS IN BANGALORE!